Enjoy the excitement and exhilaration of white water rafting on the King River. 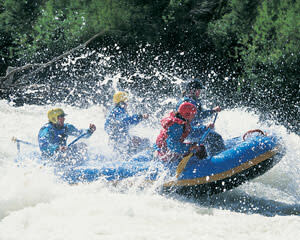 Rafting on the King River is an action-packed full day of canoeing on Grade 2 white water. Enjoy the excitement and exhilaration of white water rafting on the King River. Your day will begin with a safety briefing from your experienced guide, before getting kitted out with your helmet, paddle and buoyancy vest. Then it’s time to hit the water to learn the basic commands that you will need to get you through the 16kms of Grade two to three rapids ahead. (Rapids are graded from 1-6, with 1 being easiest and grade 5 being the highest grade permitted for commercial rafting groups). As your guide yells out to you, “forward, hard paddle” you will explode through forty, non stop, action packed rapids with names such as The Escalator, Weir, Surfing Wave, Dual Flush, Playground, Ego, Thumper, Churner, Double Barrel and the Whirlpool. There will be plenty of time to have fun surfing waves, crashing through stoppers and enjoy ‘going with the flow’. Morning tea and lunch is included. The King offers a day of fun and excitement in the wilderness and no previous rafting experience is required. Second pair of shoes or pair of thongs to change into at the end. Minimum of a two litre water bottle - with water in it! Location: The King River is about 4 hours drive NE from Melbourne. Minimum of 6 people required for a trip to go ahead. Individual and Group bookings welcome. One day trips run on the King River every weekend throughout the rafting season (August to November, providing suitable water levels). You can expect your day to start at 9.30am and finish at approximately 4.00pm. What about photos/videos? We recommend that you bring you own camera - waterproof is not necessary but highly recommended.